Filter Date: Is This A New Litter? 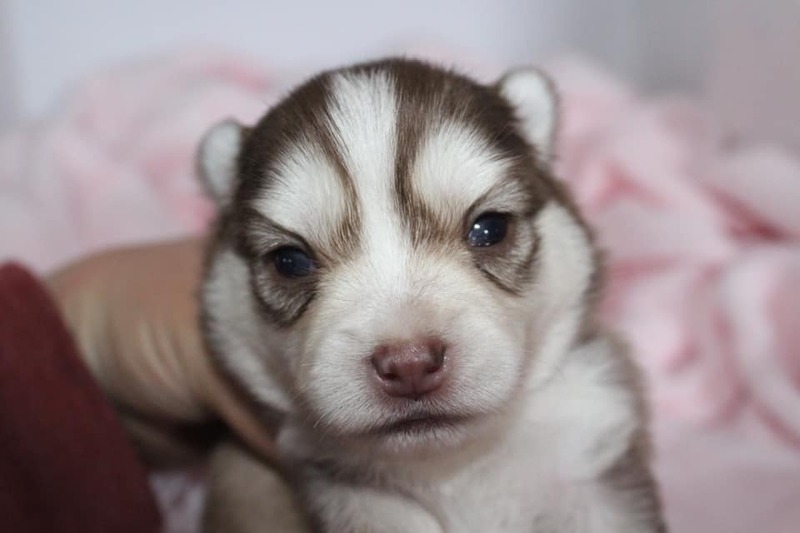 Filter Type: Any 25/75 Pomskies Available? Filter Gender: Any Male Pomskies Available? 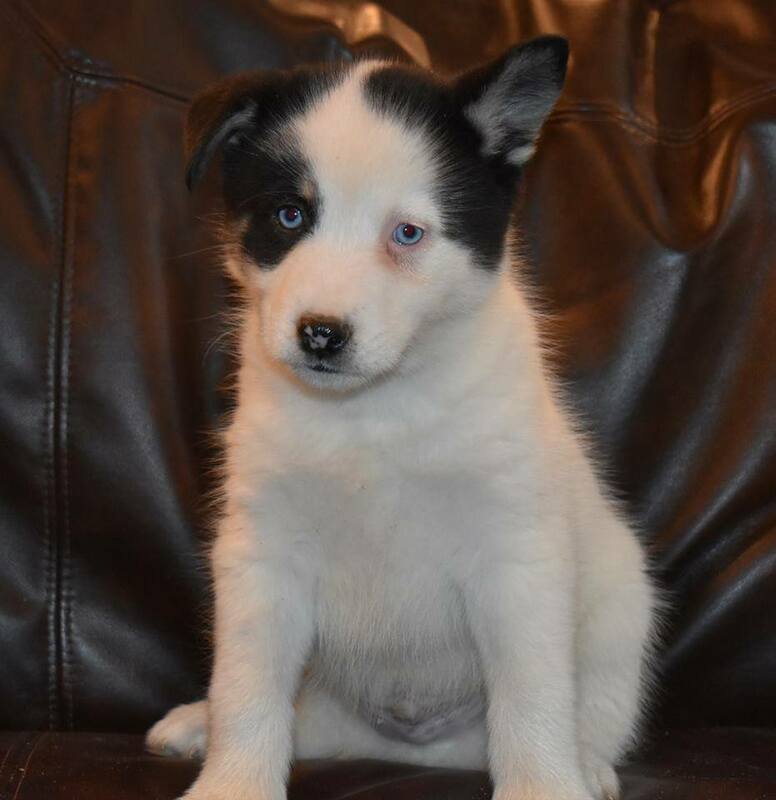 Filter Markings: Any With Husky Markings? We are a small hobby, but ethical and quality breeder, located a couple hours south of Chicago. Our pomskies are our family. We treat them as such, not just as breeder dogs. 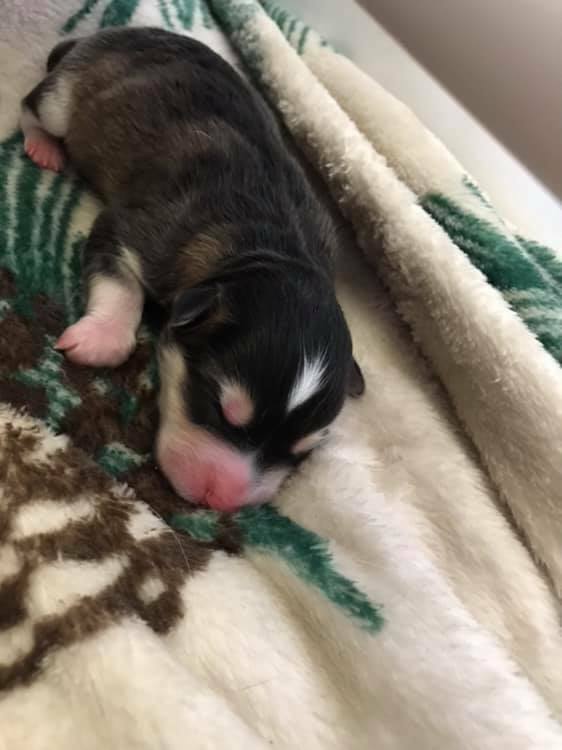 We aim to produce quality, healthy, and happy puppies! We raise our puppies within our home. 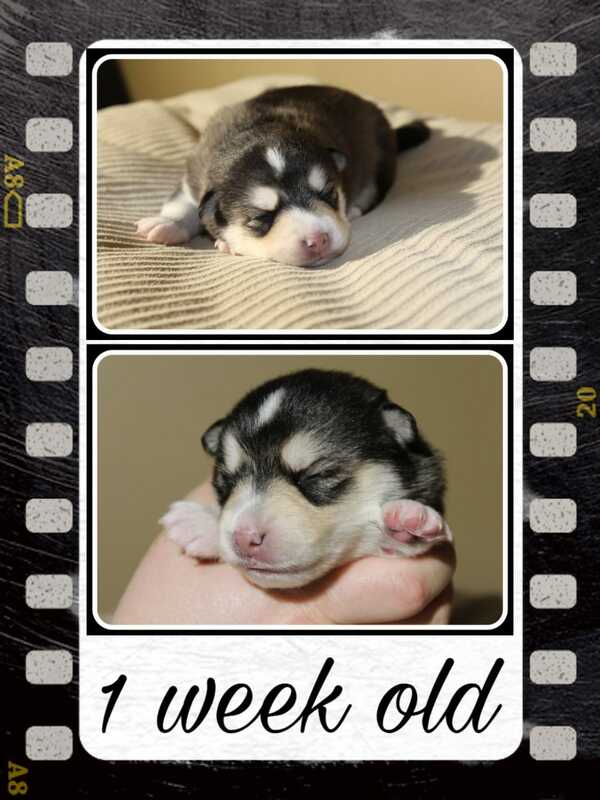 We take pride in the puppies that we produce and want to provide you with a great pomsky puppy. 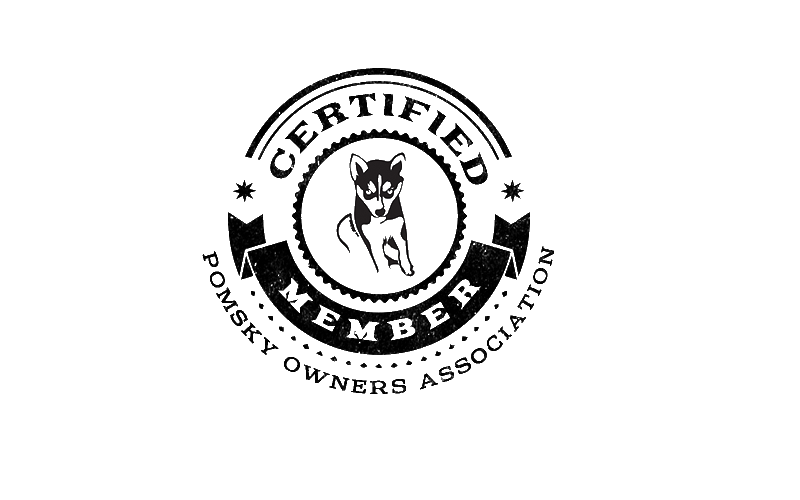 We are a member of the International Pomsky Association (IPA) and Pomsky Owners Association (POA). We abide by the Code of Ethics of both groups. Please click each image below to view more photos. Each image will link to more photos from the breeders Facebook page or Website. 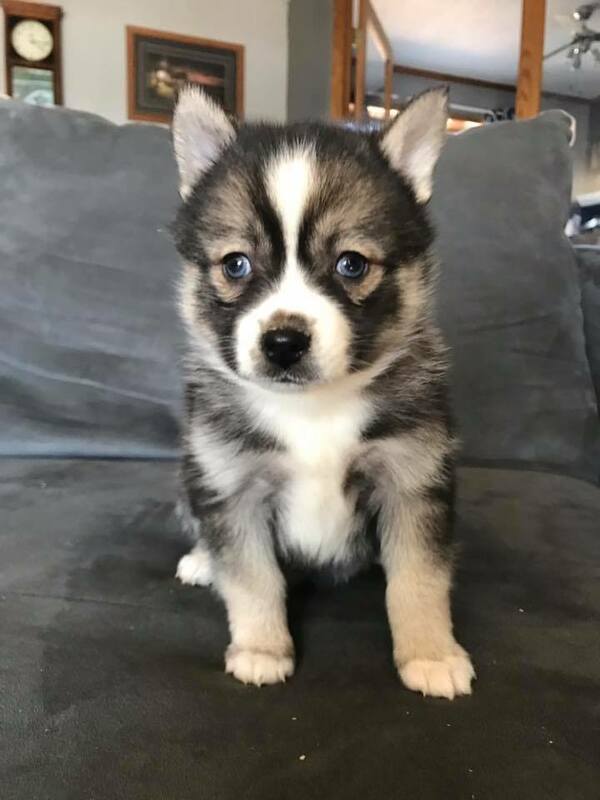 We are a small family breeder who is crazy passionate about the Pomsky breed! Please enter facebook post url. 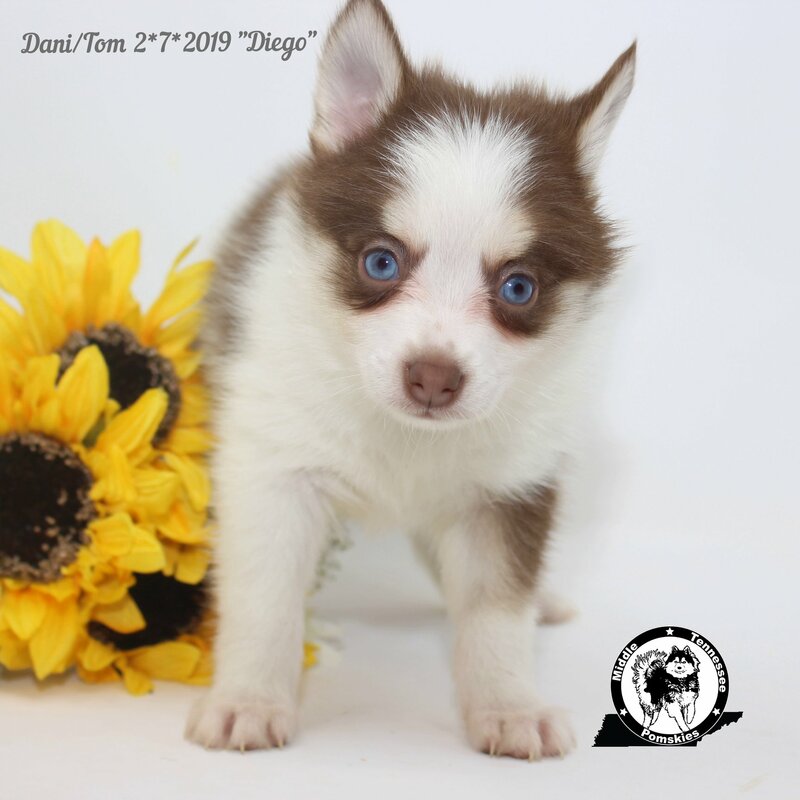 Dakota Pomskies is a young family bringing beautiful, intelligent, playful F2 Pomsky puppies to your family! We love our Pomsky momma, Aurora, who has just brought us her first litter of F2 Pomsky puppies. We are a small family Pomsky breeding farm. We have 42 acres in the country where we are raising our puppies and our 4 children. 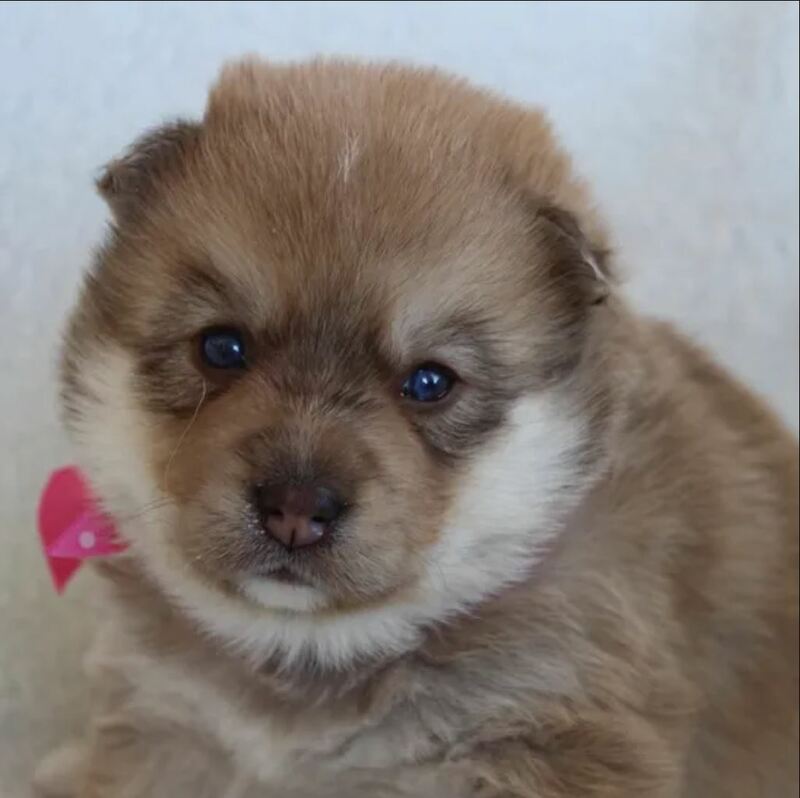 We currently only breed Pomskies, but may expand in the future. We at Maine Aim Ranch are so blessed to do what we love to do! We live on a ranch in Southern Iowa and I homeschool my two youngest children. We have been involved in raising and showing cattle, both my husband and I since we were born. This is extremely helpful when choosing our breeding stock and the health care of our dogs. We know the importance of great vaccination program, overall health care, and socialization of our dogs/puppies and livestock. Our dogs are part of our family, and we love each and every one of them and we love each and every pup like our own until they are blessed to become part of their new family. 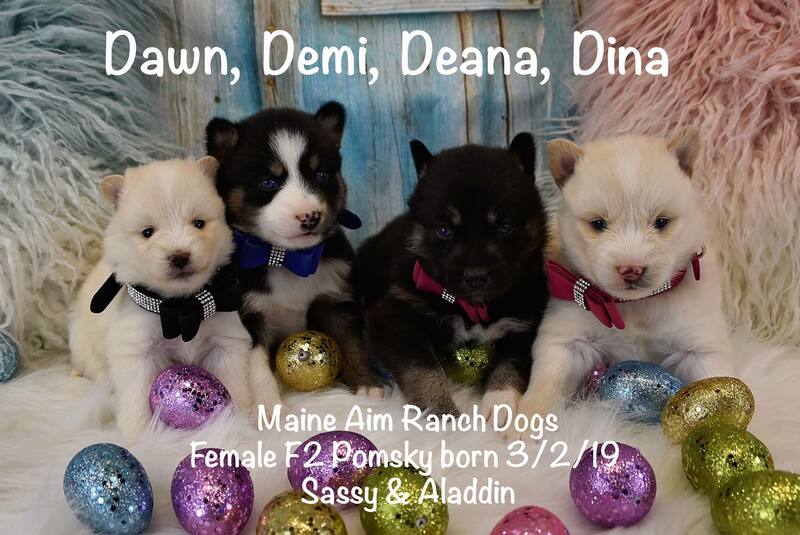 Please consider Maine Aim Ranch Dogs for your next puppy! We are a family that is in love with pomskies! We only have a few of these beautiful babies that are part of our family, not just breeding dogs. We have 2-4 litters a year. We strive in producing quality puppies that are healthy for life and have great personalities. Our puppies are raised with small children and they are well socialized. We are located in Central Michigan in the beautiful countryside. We love meeting new friends and sharing our love of pomskies with you. I Alisha, the owner of Riverdale Aussies and Pomskies started off about 4 years ago when my mom could no longer breed Australian shepherds after having a major back surgery. I started off breeding aussies then bought myself a husky since I had always wanted one (Luna). 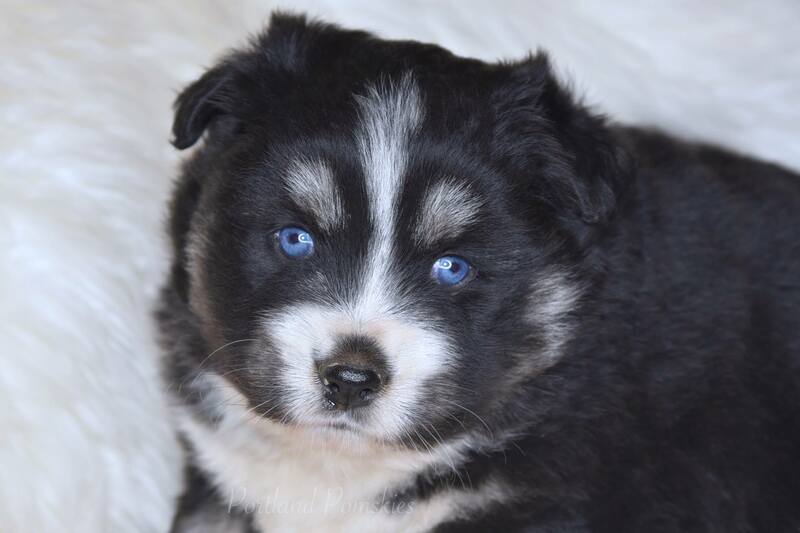 Luna was bred to Rylee for an aussie/husky litter and did they ever have beautiful puppies! 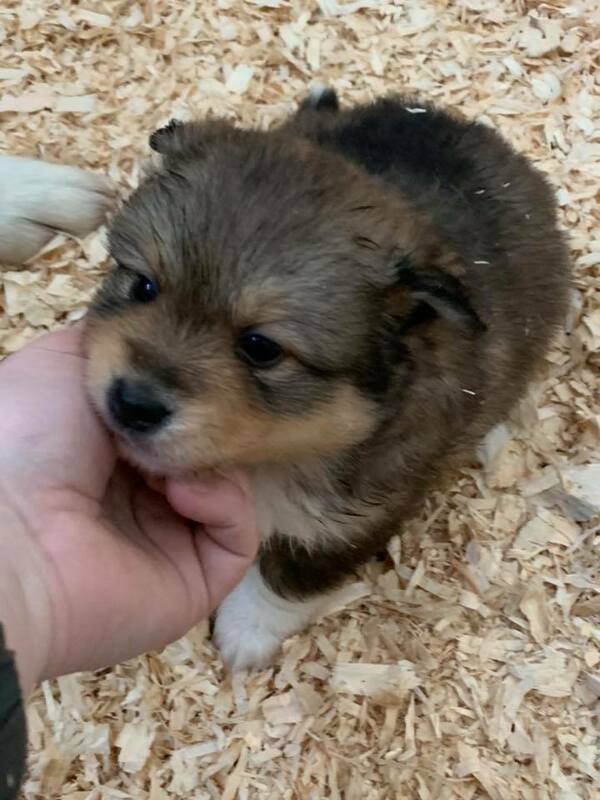 Riverdale Aussies and Pomskies only started this year of 2017 we had one Australian shepherd (Koral) and one Husky female (Luna) and she had already had two litters (not pomskies) we had seen the fad about pomskies and noticed that there had yet to be a breeder in Ontario. 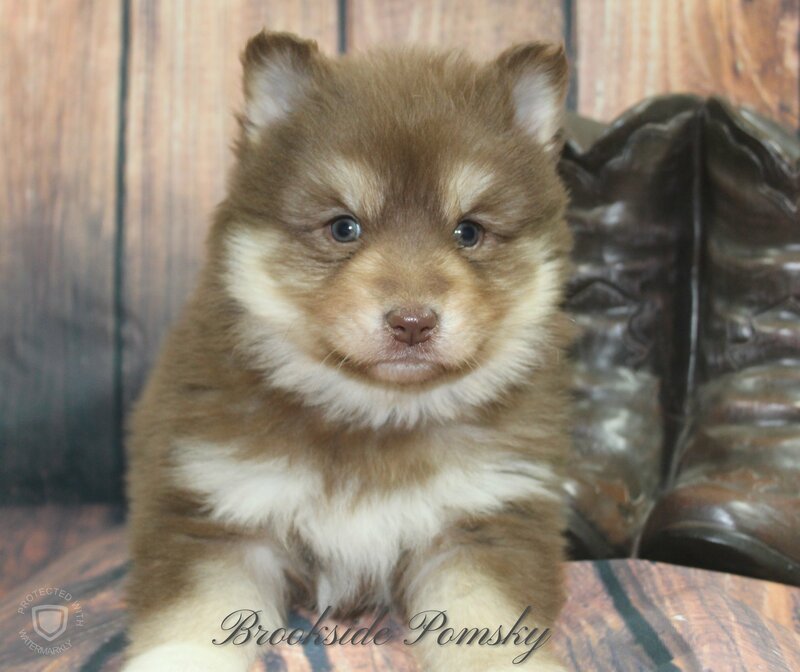 So we set off looking for a Pomeranian stud to see if we would even be lucky enough to have a Pomsky litter as breeding pomskies is very challenging! 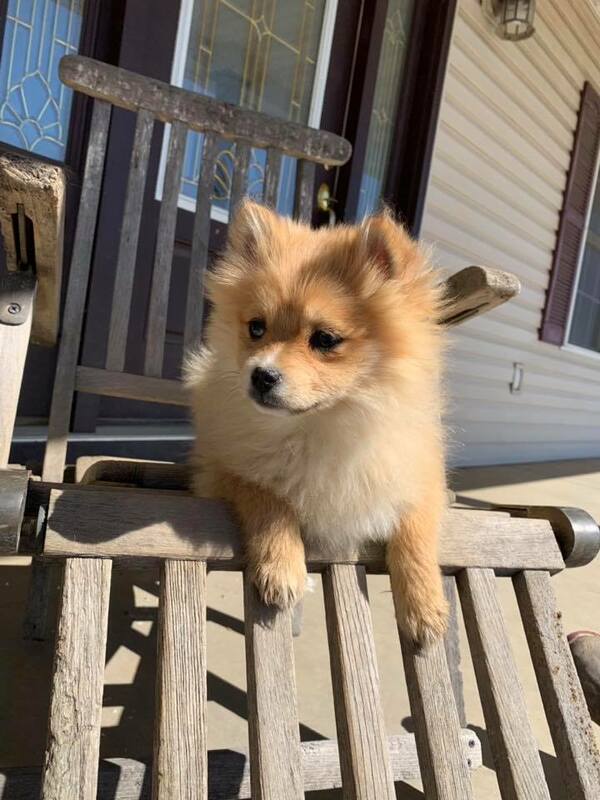 Not only was it hard to find a Pomeranian to breed to but to find a breeder that would allow someone to breed they're Pomeranian to a Husky via artificial insemination and in result of a cross breed. We had gotten a lot of flack from breeders when on the search finally we found the owners of River. Rivers owners were kind enough to let me pick up River and bring him to the vet with my Luna and do the procedure. They then made me an offer I could not refuse. We ended up taking River home with us and it all started! Luna was confirmed pregnant a month later. Another month went by and we were blessed with 4 healthy Pomsky puppies! We then continued to purchase more females which you can find on some of our pages. Boy have we ever taken off with new clients almost every day wanting one of these adorable puppies! 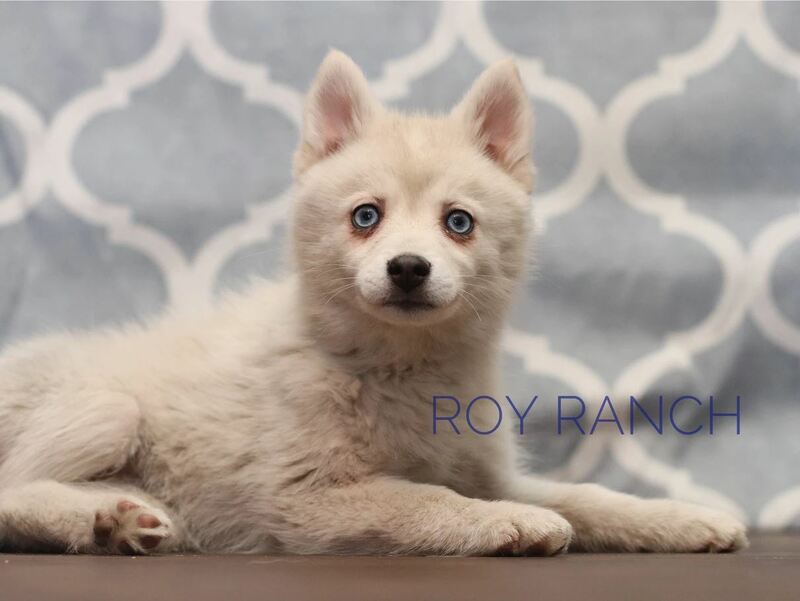 Roy Ranch is a family-based operation where we put our passion into animal husbandry. We are located right outside of Scotia Nebraska, where we have raised our 3 daughters and laid down our roots. On the ranch we raise commercial black angus, AQHA quarter horses, pomskies, and bengals. We strongly believe in being Nebraska Strong and are beyond thankful to live in such an amazing rural community. Our family has been raising animals since we came America. Our great-grandfather started our family in animal husbandry by leasing out a pair of Perchron Stallions across the Midwest. He would travel all over to small ranches in order to trade work horses and spread superior genetics. From there, the Roy’s have ran a Grade-A Dairy farm, finishing feedlot, and a cow-calf operation. You could easily say that our roots lie in the ranch lifestyle, but we believe in producing quality genetics for the animal industry. 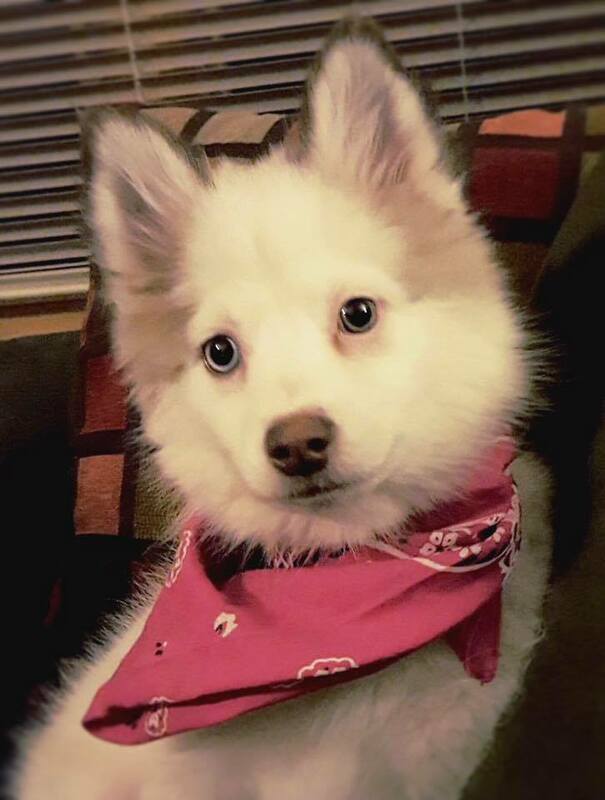 Since we have gotten into the pomsky breed it has really opened another aspect to our lives. Our journey started when we rescued a male Siberian husky from our local animal shelter. We automatically fell in love with the breed. Once we decided to raise them ourselves we heard about the new designer breed of Pomskies. This was the perfect combination between huskies and pomeranians as it truly is the best of both worlds. Our foundation stock is part of our family and goes every where with us. Our males and females are the basis of our program so the quality of their lives are at the upmost importance to us. We take great pride in our superior genetics and strive to produce quality puppies. Our puppies are very intelligent with sweet temperaments. They are well socialized, loveable, smart, and healthy puppies! The pomsky breed has proved to be an amazing family dog and we are infatuated with the breed!